In 1953, a young man born in Viramgam, Gujarat. He was raised in Nizamabad, and right from his early days, he had a burning passion to become a confectioner and was dedicated to make his passion as his business. In 1972, at a young age of 19, he decided to wait no longer to bring his passion to life. He started his first sweets shop named Maharaja Sweets in Ahmadi bazaar, Nizamabad. Within 8 years of opening his first shop, he established his second sweet shop in the year 1980, by the name of Sagar Sweets, which was also set in Nizamabad. In 1995, he established his third sweet shop, by name Modern Sweets, but this was located in Hyderabad city. After pursuing his passion in India, he believed it was time to move to America to progress his passion in a larger scale. In 1997, he came to America and built his way to his present flourishing business of Gokul Sweets. 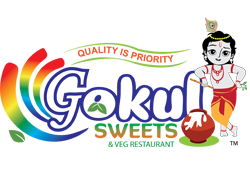 11 successful years after the first Gokul Sweets setup, the second location of Gokul Sweets was established in 2013. In September 2015, The brand image of Gokul Sweets got a big boost, through our new logo. In October 2015, we launched our modern new website with online ordering capabilities. Our 3rd location in Duluth, will be grandly inaugurated sometime in November 2015.